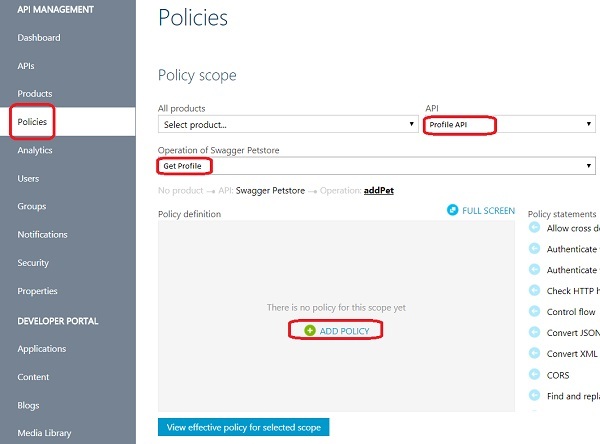 What are steps to set up policy to an Azure API Operation 2017 version? 1. Login to Azure Portal. 2. Go to API Management Services and select your service. 3. Click on Publisher Portal. 4. Click Policies on the left. 5. Select the API service and the API operation from dropdown lists. You see the "ADD POLICY" link in the policy statements area, if there is no policy created to this operation. 6. Click "ADD POLICY" link. You see a default policy XML document showing up. 7. Add policy statements into the policy XML document and save it.